Touring a college is the best way to see if a university is the right fit for you. All visits include a group information presentation with an admissions counselor and a student-led campus tour. After the tour, if you have additional questions, you are welcome to sit down one-on-one with an admissions counselor. We offer visits specifically for transfer students. Find one here! Make travel arrangements and find things to do while you're here! "Meet UWEC" receptions bring our college visit to your area! See if there's one planned near you. Our special visits offer an in-depth view of campus and additional interaction with faculty and current students. Explore the options available to you below, and especially keep an eye out for the sample agendas we’ve provided for many of the visits, which will give you a more detailed look at what is included in each day. Admitted Student Visit Day is an optional visit exclusively reserved for admitted seniors. Admitted Student Visit Day, an optional visit exclusively reserved for admitted seniors, offers an in-depth look at campus, residence hall open houses, and an opportunity to check off your next steps to becoming a Blugold. This visit will provide an opportunity to see campus before making a final commitment and attending official Orientation in June. Your day is yours to design as you wish — what you do and how long you stay on campus is up to you! To see what kinds of activities a typical Admitted Student Day would include, take a look at this tentative agenda. None currently scheduled, but watch this space for future tours! In addition to our regular transfer campus visits, we have a special visit day exclusively reserved for admitted transfer students. Blugold Spotlights tours offer the opportunity to explore the wide range of majors and student services at UW-Eau Claire and chat with current Blugolds. Blugold Spotlight days allow you to explore the wide range of majors and student services at UW-Eau Claire in an open house format. You will also get the chance to chat with current Blugolds and have the opportunity to schedule an appointment with any department or major. Come see how UW-Eau Claire gives you the tools to succeed. Have you been exploring our programs and found one you are interested in? Get a closer look by touring the facilities, talking with faculty and students and more. Click on the program below to see the next upcoming tour. Availability of tour dates can vary. Want to learn more about business programs at UWEC? Come to this specialized visit and get the chance to sit in on a class, tour campus and eat lunch with a current student. Check out this sample Business Visit Day agenda to get an idea of what your day might be like! Have you heard that we are the 3rd largest producer of educators in Wisconsin? Come learn about our Education program, meet with professors, attend an education class and tour the building. Check out this sample Education Visit Day agenda to get an idea of what your day might be like! 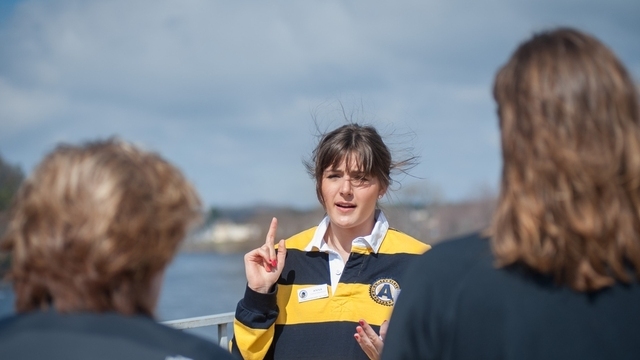 Want to learn more about the Kinesiology program at UW-Eau Claire? In addition to admissions information and a campus tour, this visit gives you the chance to meet with Kinesiology advisors, faculty and students; observe demonstrations in labs and see facilities; attend optional classes and enjoy lunch on campus. Check out this sample Kinesiology Visit Day agenda to get an idea of what your day might be like! Whether you plan to major/minor in music or want to command the stage in another way, UW-Eau Claire has you covered. Come sit in on a rehearsal, meet with the music and theatre department chair, tour the building and more! Check out this sample Music & Theatre Visit Day agenda to see what your day might be like! Find out why nursing is one of our most popular programs. This day includes an in-depth look into the program through an information session, a tour of the nursing building and an optional campus tour. Nursing Visit Days (click to view a sample agenda) are offered throughout the fall and spring semesters. Learn more about how UW-Eau Claire prepares you for graduate school and beyond at our pre-professional day. Receive a presentation and tour of campus, get the chance to meet with the Health Career Center Director, plus you'll get a tour of the Health Career Center. Check out this sample Pre-Professional Visit Day agenda to see what your day might be like! See what a day is like for a psychology student. When you visit you'll get admissions information and a tour, plus you'll meet with the Psychology Department Chair, sit in on a psych class, and have lunch on campus. Check out this sample Psychology Visit Day agenda to see what your day might be like! Are you interested in science, technology, engineering or math? Come to STEM Day and tour our lab facilities, meet with our talented faculty and see how a degree from UW-Eau Claire can make you stand out from the rest. Did you know 1/3 of students are undeclared? If you haven't decided yet, don't worry! UW-Eau Claire is the perfect place to find your fit, and this day will show you all the resources we have to support you in your journey. You will get the chance to meet with an academic adviser, explore the Career Discovery Center, attend exploration sessions and take a campus tour. Check out this sample Undeclared Visit Day agenda to see what your day might be like. Campus ambassadors are current students who show you around campus and answer your questions. If you are interested in a certain program, set up a time to meet with faculty in that department while you are on campus for your tour. Please check your confirmation email — it will provide visit details and a printable parking pass. If you are visiting on a weekend or were not given a pass, stop by our Visitors Center and they will provide you with a pass or direct you to parking. To find the Visitors Center either click on the information below to open Google Maps or you can punch the address into your smartphone or GPS. Travel arrangements and things to do in Eau Claire can be found here! To see more information about maps and parking, check out the maps and directions page. If you've already visited campus and would like to explore on your own or meet with someone, you are welcome to use the contacts below. Arrange a meeting to sit down with a faculty member and talk about how you can achieve your goals at UW-Eau Claire. Schedule an appointment with one of our outstanding coaches during your visit to see what the life of a student athlete is like as a Blugold.